Dani Alves has ended his eight-year stay with Barcelona after joining Italian champions Juventus in a move that he describes as an "adventure". The 33-year-old right-back was permitted to leave on a free transfer, his relationship with the La Liga champions having deteriorated over the past 12 months. The much-expected transfer has finally been confirmed, with the Brazil international being presented to the fans in a press conference earlier this week. 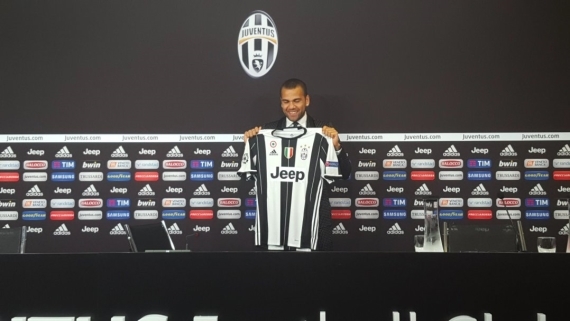 "It's a real honour to be here and to join this team," Alves said. "I chose Juve because I love to dream, and I love to dream with great teams and great players. "I think Juve have a great dream, which I want to share and help accomplish. I know Juve haven't won a Champions League in a long time and that they want to win it again as soon as possible. "They've been the leaders in Italy for very long and they want to triumph in Europe too. They have some very important players and a great history. I like teams like that and I want to be part of that history. "I think this will be a really interesting experience, what with living in a different country and discovering a new type of football that I don't know. That's why I chose this adventure. "I want to share my dream with all of you and I want to reach the common objective." Alves joined Barca in 2008, as one of Pep Guardiola's first signings. He went on to play 247 league matches for the Spanish giants, winning three Champions League and six La Liga trophies.